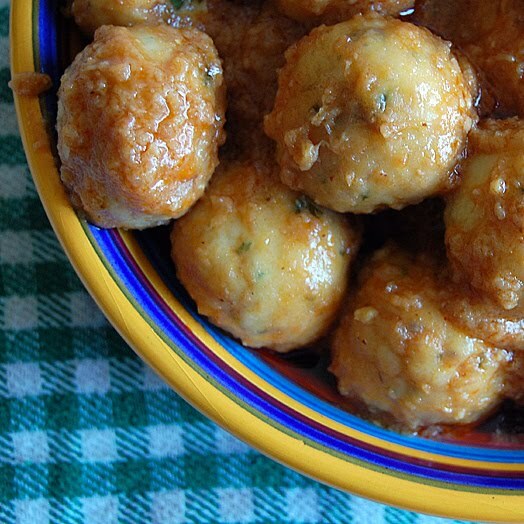 Fish Balls in Nuts Sauce. 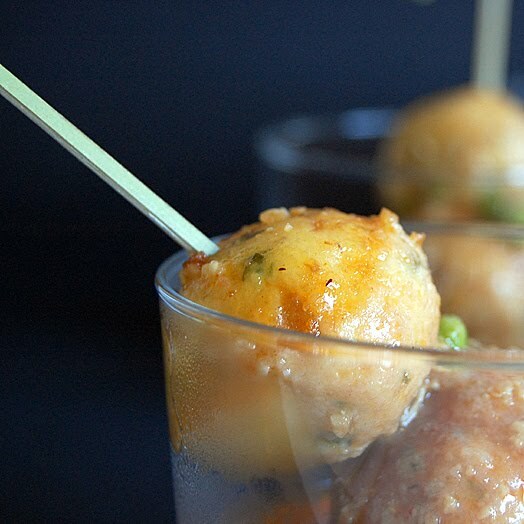 Maybe you’ve never tried with Fish Balls before, maybe you only gave Meat balls a chance. Well, here you have the opportunity to learn how to cook delicious Fish balls and present them in a different way. 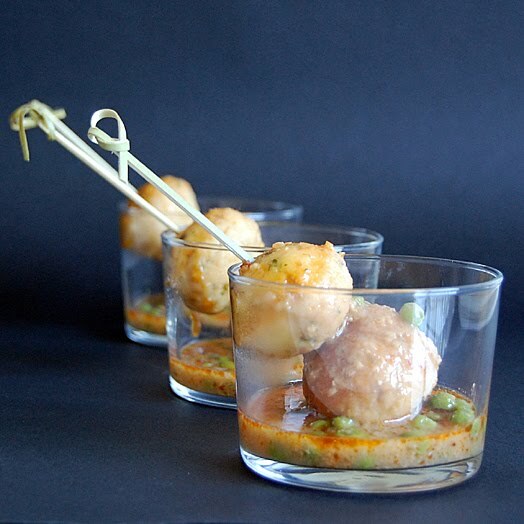 They are clearly a second course but if you use a glass and nice toothpics maybe you can have them as a tapa too :D. If you happen to be in Spain you should ask for albóndigas (de pescado, in this case); where albóndiga means meat/fish ball and pescado is fish. I used hake as the main ingredient, but you could also make them with monkfish and shrimps or with seabass… just up to you! Also, peas are optional, but their colour cheers the dish a bit and since they are now in season, I would recomend you to use them. I’m leaving for the weekend and going HERE, I am not telling you this to make you jealous, I’m telling you to share my happiness! Can’t wait to taste their dishes and can’t wait to taste their hot and medicinal waters. See you all on Monday :D.
Ingredients for 4 servings: 200 grs of fresh hake, flour, a thick slice of bread soaked in milk, 1 egg, some fresh parsley springs, 3 garlic cloves, 1 toasted slice of bread, 15 toasted hazelnuts, 1 ñora's meat, salt, black ground pepper, olive oil and some fish stock. Make sure you clean the fish completely, take the bones and skin out. Use your fingers to crumble the meat in tiny portions and put them inside a big bowl. Add the squeezed bread soaked in milk to the bowl, 1 garlic clove (peeled and minced), the egg, half the minced parsley, a pinch of flour, salt and ground black pepper. Mix all the ingredients well and use your hands to make little balls. Get another bowl with flour inside and place the balls to prepare them for the frying. Heat some olive oil in a frying pan and when hot, throw the fishballs in and keep on turning them until they get a golden colour. Reserve over kitchen paper so that they leave there all the oil. Prepare a picada with a mortar: place inside the toasted bread, the hazelnuts (peeled), 2 garlic cloves, the ñora meat, the rest of the parsley and salt. Smash it all until you get a thick paste. Add a bit of olive oil and reserve. Get a bit sauce sauce pan and place the fishballs inside, add enough fish stock to nearly cover the balls and simmer for 10 minutes. Add the picada and the fresh peas (optional) and simmer for another 5 minutes. Taste and add more salt if necessary. Let it rest for another 5 minutes and serve hot. The fish balls sound like a lovely tapa Nuria! They look beautiful…and I definitely like the peas in the sauce. Enjoy your time away! Rico,rico y original Nuria, y las fotos alucinantes, que te puedo decir de ellas….y no he conseguido ver donde vas este fin de semana, pero aun asi te deseo que lo disfrutes!!! eisss! m’encanta el teu blog! em dic Adriana, soc una catalana ‘refugiada’ als estats units… jo tambe tinc un blog, tambe en angles! m’ha encantat trobar les receptes en angles per poder-les compartir amb els meus companys de pis! perfecte! te n’agafare alguna per fer-la jo! com la mona de pasqua! I just came across this photo on Tastespotting and followed the link to your blog. 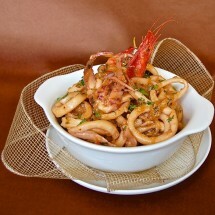 This dish looks so yummy! Ay que rico! I love this and I love your photos. Enjoy your holiday. These seem easy to make and flavorful; I need to make them, soon! this sounds like a delicious recipe and your photos are so pretty! Olé!! vaja presentació elegant n´has fet d´aquestes mandonguilles, ets la reina de les presentacions i la recepta ha de ser espectacular…petonets!!! Quina presentació nena! les mandonguilles es veuen brutals! 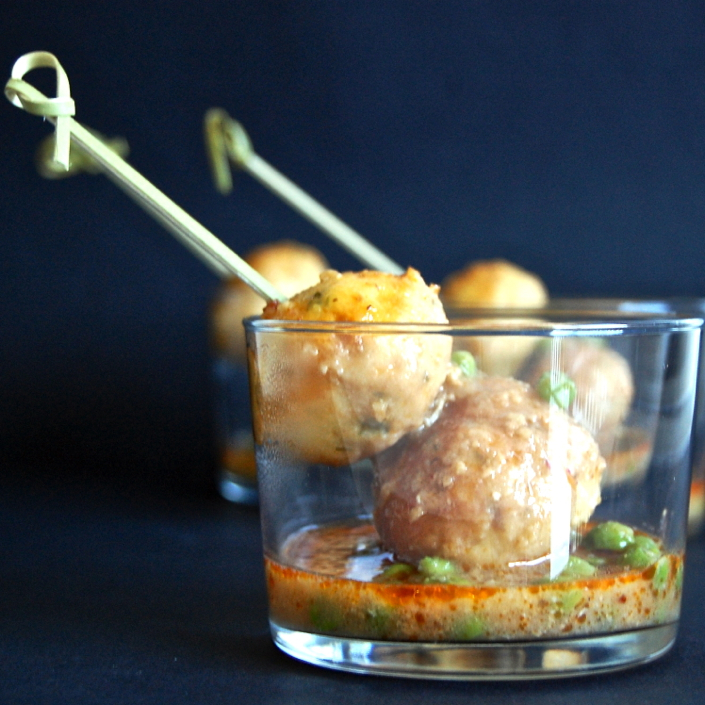 I just found a recipe for almon balls – these look better…. thanks. < Pinchitos, Montaditos… all kind of Tapas!